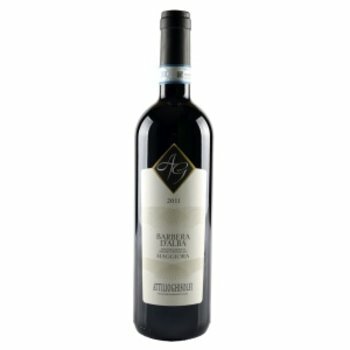 Made from Barbera grapes from the most recently planted plots in the "Visette" side of Montforte d'Alba. Plant Density: about 5000 vines per hectare. Height from 350 to 400m above sea level. Winemaking: Initially a cryo-extraction of 34 hours to the freshness and flavors of the wine bring out the full, followed by maceration on the peel for another 4 days at controlled temperature. When fermantatie, it uses its own yeast. Maturation takes place in small oak barrels for 12 months. The color is a deep ruby red with garnet glare. In the nose a powerful aroma with lots of fruit. In the mouth we get an attractive, lush and well-balanced flavor, with hints of raspberry and forest fruits. Storage temperature: between 13 ° and 15 ° C.